- Has Jillian Douglas-Phillip been snubbed by Education & Culture Minister Hon Myron V. Walwyn? ROAD TOWN, Tortola, VI- Word just reaching our newsroom from our well-placed sources within the Ministry of Education and Culture is that the controversial Minister for Education and Culture Hon Myron V. Walwyn has reportedly recommended through his Permanent Secretary that Ms Connie George, an Education Officer within the Department of Education, is to be named the new Acting Chief Education Officer. The post was advertised and there was said to be about five applicants, including the current Acing Chief Education Officer Mrs Jillian Douglas-Phillip, who has been acting in the post from June 2012. Officials at the Ministry of Education are tight-lipped on the possible appointment of the new acting Chief Education Officer (CEO). It is also believed that Mrs Douglas-Phillip was snubbed by Minister Walwyn, as no Chief Education Officer would have been appointed without the approval of the subject Minister. Our newsroom is investigating the fallout between Mr Walwyn and Douglas-Phillip as less than a year after Hon Walwyn took office [2011-current] he got rid of the then acting CEO Ms Beverlie Brathwaite and replaced her with the same Jillian Douglas-Phillip. Education in the Virgin Islands has begun to suffer from lack of funds and political leadership. In the past three years many parents, teachers, civil society and students have said the education system has gone to the dogs, as it has become too political, and that children can do as they please, while teachers’ morale are low. Many complain that at some public schools in the territory there are lack of basic items such as water and toilet paper. Fights continue to dominate the Elmore Stoutt High School (ESHS), and teachers are forced to take funds from their pockets to purchase basic teaching supplies. The Minister for Education, Hon Walwyn came under fire for taking $1Million of public funds before the 2015 general elections to build a small wall around the ESHS that has not done anything to address the safety issues at the school. 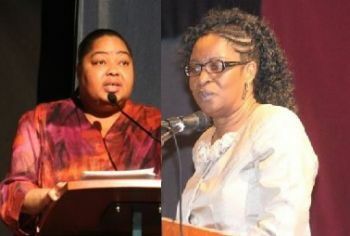 When this news site broke the story after Dr The Hon D. Orlando Smith told the public of the cost in an answer to a question in Parliament, Hon Walwyn first told the public that his Leader and Minister of Finance Dr Smith had misled the public on the figure in a House of Assembly answer to a question. Later, the Education and Culture Minister changed his tune and admitted that the wall was a million dollars, but if it had been put to public tender it would have cost tax payers two (2) million dollars. Many in the intellectual and political class have scoffed at the attempt to justify what they have labelled as abuse of tax payers’ funds. The ministry of education gone from bad to worst. My prayers are with them now. Connie George is Good People! She has my support. Never looked at it that way. You have a point there, but we all may be guilty of such, especially professing the god that we so like to serve. Nothing is never what it seems with the input of other perspectives. We all has some work to do; there is still hope for us so long as we decide to put in the work required to do so and not expect god to come and do it in the physical. We were given hands and brains for earthly work. That also goes for all those so-called “god fearing brothers and sisters in christ” as well. We have to Stop using god’s name in vain if we don't intend to carryout his will. As an educator this news is quite entertaining as the replacement isn't any better. Sorry to say but not much change will happen as all the replacement good at is delegating and hope for praises in the end. My advice to you Mrs George is to please learn your role and responsibilities well as its not just a title. Wasn't there an interview process? Isn't the Minister acting on the advice of the PSC, after their deliberation? Isn't the Minister on the latter leg of the process? Why is he being blamed for choosing one over the other? 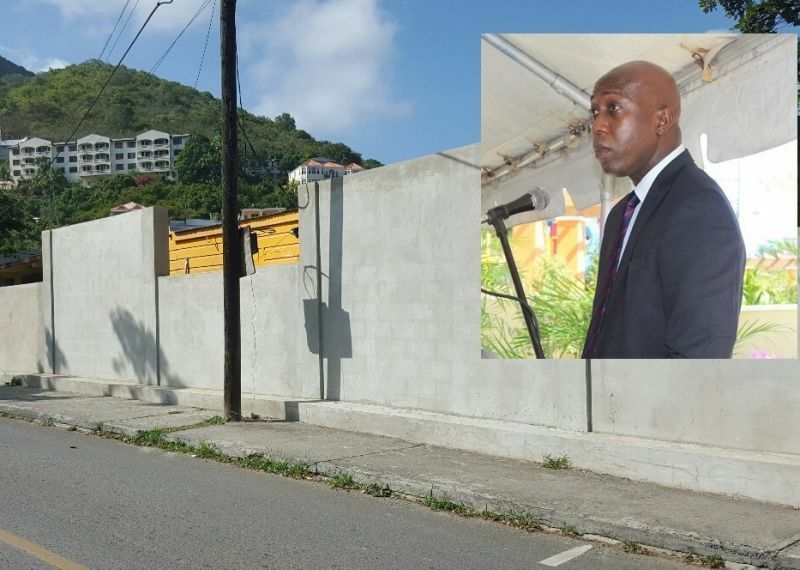 "The Minister for Education, Hon Walwyn came under fire for taking $1Million of public funds before the 2015 general elections to build a small wall around the ESHS that has not done anything to address the safety issues at the school. This is a STUPID IDEA!!! Mrs. George is a great educator with morals.. I feel sorry for you if you think Connie George is the answer. I am not happy if this is our next ceo, but like everything NDP has done, we will all have to grin and bare it. Born Again Christian doesn't mean a thing. Some of those Christians are just as crooked or worst than people who do not profess to know Christ. They know better, and should do better, but they just like everyone else hide things under the rug and pretend everything is right. Madam CEO, go with God and may God go with you. I am not eligible to choose the CEO but now that you are my boss, I will fall in line and support you and the system as much as I can. "Yeah, though I walk through the valley of the shadow of death, I will fear no evil. For thou art with me, thy rod and thy staff they comfort me." Well. I do hope that we will see a change for the better. My suggestion is for whoever becomes CEO is for that person to leave the office and visit ALL the schools regularly and see for his or herself what needs to be done to improve the standard of education. After all without a good education system the country will be better off dead. Those of you who are without sin should cast the first stone AND if by chance you can't do that, then you need to reserve your comments and stop from being so critical. The two ladies in question are equally qualified and they have both done an excellent job in the education system. Jesus has the FINAL SAY and NOT the Minister, PS, TSC, PSC, or else. Hlscc down the drain to.....friends in position and not doing a darn thing. They need to appoint a new board and move it back under the premier. What happened to the Chalwell-Brewley women? She has her PHD. BVI education has begun to suffer? Really, you only just now noticed? A thing to tell da king...IMHO, the leaders of the BVIs have totally abdicated their responsibility towards the future generations of the BVIs. Can anybody name one valid rational reason why the BVIs should not be the leader in education in the Caribbean? We have the funds, or at least used to. Who will replace the present leadership? They're all in the BVI educational system now, so what can we expect? Again, where there is no vision, the people will perish, as Mr. Stout was fond of saying. BVI Education isn't suffering because of Government but rather poor parenting and kids being left to fend for themselves in every way shape and form. Nobody wants to take responsibility for their actions around here! Ask yourselves why there's always a set of kids that, no matter which Government School they attend, they get good grades, have manners, turn out to be productive people in society, why? Because their parents take responsibility and raise them well, not using the School and Government as a crutch. Government has a responsibility to put our tax dollars to the best use when it comes to Education and everything else. But we as parents and a society have a major role to play as well and we are falling short in a major way. Stop with the excuses and step up, this is our Country. Speak the truth, man. Ah say, speak the truth. The education system is not bad because of Myron, Douglas, Connie or the 'relse. If it is bad, it is because all the trushies who fulling up our schools and where our monies should be spent to better the infrastructure and improve the teachers, it has to be spent elsewhere. Look nuh. Education's resources are stretched and ready to bus because we got too many non-Virgin Islands churren in our schools. You come to work, leave them where you mek them. Don't burden our system. If a person is good to act for 4 years they should be confirmed in the post. The prime minister should see that the appointment is made..
You can forget about that happening. That's her cousin-family! There are many bloggers on here who will not agree with me, and that’s fine. It really doesn’t matter and the truth is the truth. First of all, what our country needs more than anything is to be led by true, God-fearing Christ-like folk. We need men and women with good Christian ideals who know and understand that there is a higher power to whom they are responsible at the end of all age. Knowing Mrs. George personally as a God-fearing, Christian woman with great vision, I have no doubt that she will do a tremendous job, and accomplish tremendous things under His leadership. We need to stop with the belief that it will all be the “same old, same old”, and spouting foolishness about “cronies”. I can promise you that Mrs. George is not the “crony” nor “puppet” of any minister or leader of this government. She works for the Almighty, as she knows she has a greater responsibility, and Him to answer to when all of this is over and done. Well said..Jack -B-Quit Connie sure will do a great job.. Correction she will be working for US, also known as Myron Walwyn. Keep God out of this mess. No one is challenging her Christianity. Only she knows about her relationship with God. What we challege is her inability to associate with people. Saying that someone does not deserve a position that they have worked for because they are a 'single mother' is disgusting. So much for morals! I will NOT keep GOD out of anything! Maybe that IS our problem. If we'll busy ourselves putting GOD in EVERYTHING, there'd be NO mess! Who is the Chief Education Officer? Connie is the new CEO for the Ministry of Education we do not want her to go in there to be acting.. It appears that all of us have been unclear dear......we don't care if she acts or she is genuine....WE DON'T WANT HER AS CEO of education,Dr. Brewley is a better choice hands down, but she won't take the post bc she does not agree with a lot of the decisions that she will be forced to make.